UBER understands that restoration projects must address varied elements, including historic preservation, modern functionality and budgeted expenditures. We approach each restoration project with an attitude of stewardship, a commitment to provide the expertise and leadership needed to preserve and maximize the value of the property, whether a complete historic restoration or simply integrating current systems into an historic structure in a cost-effective way. An essential characteristic of effective restoration is the analysis and project planning associated with such projects. That requires knowledge of historic building structures and methods, an accurate assessment of the structure in question and the ability to match materials and methods to produce a lasting and appropriate solution for the project. UBER staff members and their associates have the knowledge and experience to successfully plan and execute complex projects, restoring and preserving historic architectural landmarks from any era and ensuring their use in the future. Please reference our PROJECTS section to appreciate the particular challenges which we have effectively addressed in a wide range of restoration projects. Addressing age, climate and building materials are critical in extending the lifespan of any masonry building. Our services include inspection and detailed analysis, tuck-pointing, cleaning, sealing, and masonry restoration. Following any restoration project a regularly scheduled maintenance plan can ensure that the structure’s structural and aesthetic integrity is secure. We can design and implement such a plan to meet your particular needs. Our staff includes managers and craftsmen trained specifically for this work, with experience in quality workmanship and attention to detail. Their expertise includes custom matching of masonry materials to match permeability, color and texture. 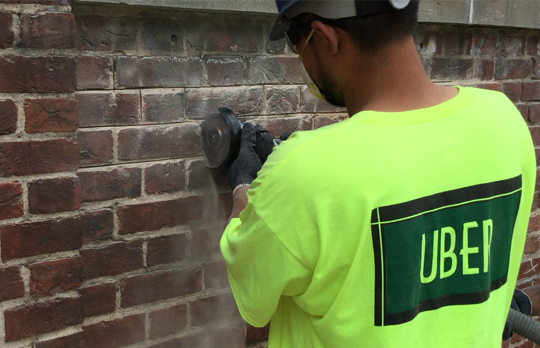 UBER has expertise in the repair and restoration of historic stonework. Our staff includes certified master stone masons, trained in every aspect of stone restoration from custom replication to crack repair and mortar repointing. We have access to effective technologies and materials currently used in historic restoration. Stone work that is too damaged to employ standard stone restoration mortar repair techniques can be replaced with stone carving completed by our expert craftsmen to match the original pieces. Projects include parapet, railing and stair reconstruction for historic structures. UBER can also provide interior stone refinishing and restoration services. Historic restoration projects require a unique set of skills with a wide range of requirements and regulations, in addition to the normal variables of building construction and renovation contracts. UBER has the experience, project management capabilities and industry reputation to develop and successfully execute complex building restoration projects. We have worked with many types of institutions, such as libraries, schools, places of worship, cemeteries, the General Services Administration, U.S. Dept. of Veterans Affairs and the U.S. Naval Facilities Engineering Command. Our services include condition assessments to develop project scopes, pricing parameters for restoration and conservation treatments, prioritization plans and regular progress reports. We can also assist architects and general contractors by providing condition assessments, specification reviews, pricing parameters and mock-ups to establish quality standards. UBER also works with historic preservation societies and advocacy groups to provide design guidelines and standards assistance reflecting local and national historic preservation ordinances and standards.